There are layers of flavors in Mexican food and it's time for there to be a light shown on it. A first-generation American and native Texan, Anastacia Quiñones is exploring every facet of her culinary heritage — and using the finesse of her classically trained techniques — to blaze a trail of modern Mexican cuisine across Dallas and beyond. Born and raised in Dallas, Texas, Chef Quiñones was not always playing to the tune of a kitchen ensemble. As a youth, she excelled at classical violin for over 10 years, performing with the Young Performers Orchestra, the Dallas String Ensemble and other Dallas orchestral groups. While violin would not be her career of choice, the discipline and drive associated with classical musicianship proved to be a helpful foundation for her true calling — becoming a chef. Her mother, Maria Elena, has always been a huge influence and inspiration to Anastacia, but traditional Mexican cuisine was not the menu of choice growing up at home. A caterer in Dallas’ prestigious Highland Park area in the 1970s, Anastacia’s mother frequently crafted and modified recipes from Joy of Cooking and other American culinary classics, with Anastacia by her side. It was only so often, mostly during special family occasions, that Anastacia truly experienced the cuisine of her culture — chiles rellenos, enchiladas rojas, tamales and calabacitas con pollo, among many other traditional and regional Mexican dishes. Because of her experience assisting with her mother’s catering business, Anastacia knew she had a natural talent in the kitchen. So, she began working in a restaurant and soon discovered her passion for cooking. Always supportive, her mother encouraged Anastacia to follow that passion but to do it with discipline, dedication and the tools and desire to be the best — that meant going to school. A graduate of the Culinary Institute of America in New York, Anastacia went on to work in the prestigious kitchen of San Francisco’s Jardiniére under the tutelage of chef and co-owner Traci Des Jardins. There, Anastacia honed her skills and developed her creativity, focusing on how to build and layer complex flavors into every bite. Returning home to Dallas to be close to family, Anastacia also returned to her culinary roots. She explored the boundaries of what people considered as Mexican cuisine. And, she learned a tremendous amount about regional dishes from the talented chefs she worked beside at places like Victor Tango, Alma, Komali and Kitchen LTO. 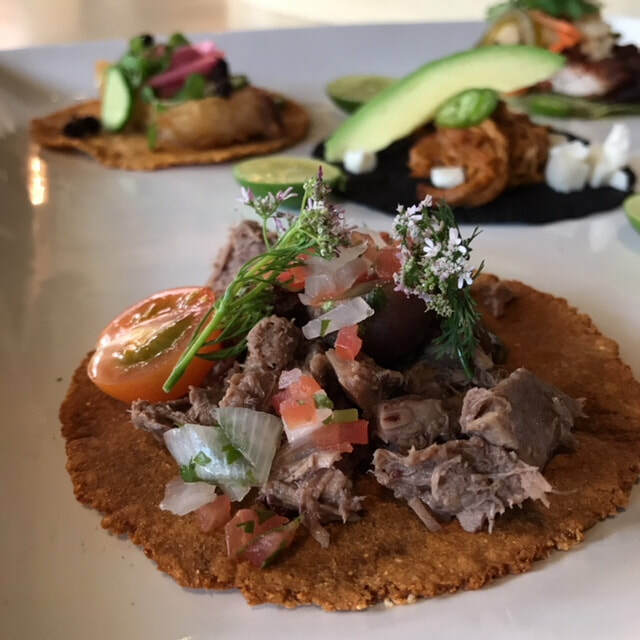 Her balanced approach to both traditional and modern Mexican food even added regional and ethnic influences to her comfort food menu at Oddfellows. And, as executive chef at The Cedars Socíal in Dallas, Anastacia brought her spin on modern Mexican cuisine to the forefront in Dallas — winning accolades in the process — including taking the top title at Dallas Observer Iron Fork 2018 and being featured in the Tacos of Texas docuseries on Indie Lens Storycast, a YouTube channel partnered with PBS digital studios. ​Anastacia is now moving in new directions and doing things her own way: Cooking her own flavors, when and where she wants, including a series of pop-ups across the Dallas restaurant scene under her signature brand Tacos de Tacha, among other projects. In partnership with several advocates for females in the culinary industry, Anastacia is playing to her strengths on her own terms and motivated about sharing her Mexican flavors with the masses.